About a half-day’s walk seaward of Milltown – just beyond the farms and fields – lies a series of low hills, the tallest of which is topped with an oddly-shaped stone outcrop. Although the locals are all pretty sure it marks the site of some First Age ruins, most of them don’t concern themselves about it. Farmers view the ruins as too dangerous, and the few adventurers who have gone there to look around either found nothing but rocks and brush, or simply never returned. A countdown to the session time is available here. New players welcome Pregenerated characters will be provided. No prior experience with Savage Worlds is required. No prior experience with Savage Mojo’s Caladon Falls is required. New players welcome. 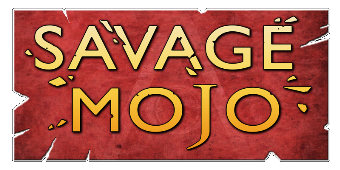 This game is sponsored by Savage Mojo. My thanks to Savage Mojo for their support. Any difficulties in the running of the session are purely my own. Awesome game! Thank so much! Glad you enjoyed the game session. Hope you enjoy the rest of FGCon 12.